Okay, We have a winner! Yes this really is Dustin's hand. 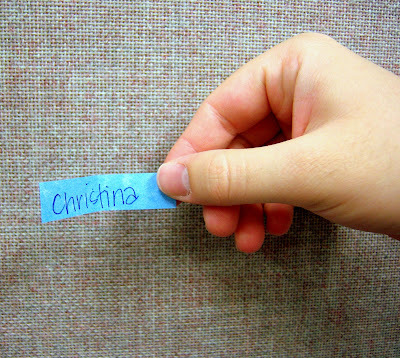 I made him pick a name out of a bowl of everyones names. Thanks to all who commented. Yippee for Christina. Congrats! I hope you enjoy this blanket and will be able to find something to do with it. Send me and email with your address so I can get it in the mail to you! Also, many of you have asked how it is that I make these receiving blankets. They are so super simple. If fact it was actually harder to make a video of me actually doing it, than it is to make one. Hopefully I will be able to describe to you how to make these. If you have any questions, just ask because this is my first time and I'm a little nervous about how it will go. First, I buy two yards of fabric (one yard of each) of flannel. I usually do two different prints that match but you could easily just do one print for both the front and the back. What ever you like best. Iron them out flat so there are not wrinkles. The I lay them out on a hard surface with the wrong sides together (right sides facing out). Smooth out the fabric from the center working out towards the edges until it is all even. Then square up the fabric using a rotary cutter and mat. Then take a kitchen plate (yes, I know this is very precise), and place it on one corner of your now square pieces of flannel. Place it just so that it makes a nice rounded edge and mark along the outside of the plate with a pen. Do this on all four corners. Then take your sewing scissors and cut along the mark you just made so as to make rounded edges. Does this make sense? 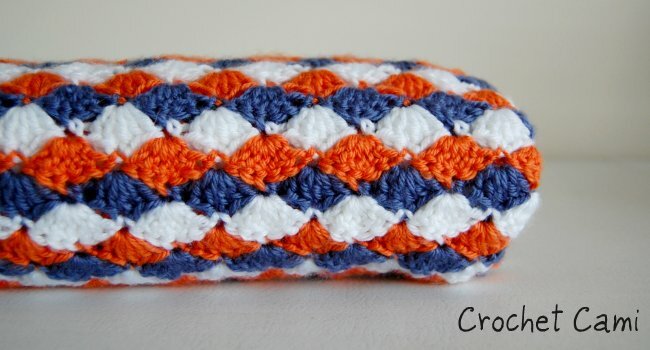 You can easily just leave them so they are square corners if you want, I just find that it goes a lot smoother when crocheting around the edges if they are round. I hope this is all making sense because it is actually harder to explain that I thought it would be. Then, with a wing tip needle (you can get these in most craft stores or in any quilting store) in your sewing machine, sew a 1/4 seam around the edges. I usually use a larger stitch length (on my machine it is set at 3.5, but I don't know if all machines are the same) but do what ever looks good to you. Just know that you will be crocheting in the holes that the wing tip needle makes so space out the stitches so that it will look nice and covered when you crochet around the edges. Note- You can buy receiving blankets with hem stitching that are ready to go. If you do this, then you don't have to worry about the first few steps, just move right on to the crochet part. I usually like to buy my own flannel and make them this way, but that is only because I can do it for less. The pre-made ones are usually around $25 per set and I can make one for around $10. Plus you get to choose the fabrics you want. Both look good. Now you are ready to begin crocheting. Yeah for crochet! 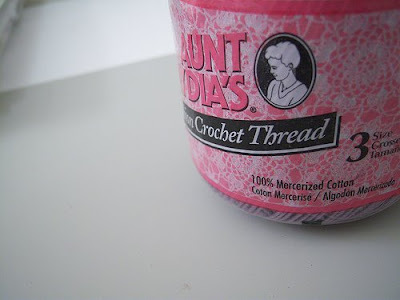 This is the thread that I use to do the edges on my blankets. You can use any crochet thread that you like. Personally I like this brand best because the weight of the thread is a little heavier and I think it is just easier to work with then the really thin stuff. Again, it is whatever you prefer. On my receiving blankets, I usually do two rounds. You can do more, but I find that usually one skein of thread is enough to go around twice (unless of course you use my favorite puff stitch, shown later, then you will need two skeins). The first round is simple. Just a single crochet. The second round it the fun part where you add the fancy stitches to make great designs. Note, you can do more than two rounds if you want. It is all up to you. On this red blanket that I am currently working on, I am actually doing three rounds because I wanted it to be a bit more fancy than usual. 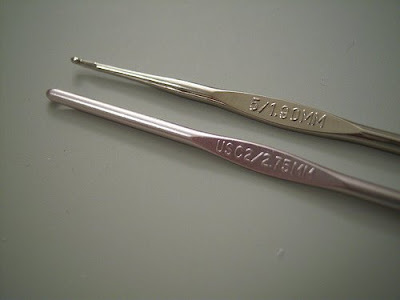 For the first round I use a size 1.90 mm crochet hook (sorry, I don't know if it has a letter associated with it). I like the Susan Bates brand of hook because I think they glide more smoothly, but any brand will work just fine. It is a smaller hook which I find is easier to punch through the fabric. The second hook that i use is a 2.75 mm hook, Susan Bates brand. I use this for the fancy edging because it is bigger and makes my stitches look more even and it is faster for me to work with. So, on to the first round. Super easy. Make a slip knot in your thread and loop over your hook. With the front of the receiving blanket (what ever print you want to be the front side, it doesn't really matter but sometimes I do a print with a plain fabric for the backside. In this case, the print is my front side) facing you, do a single crochet stitch in each hole that was made by the wing tip needle (one single crochet on each stitch). Here is a little video. Apologies for the crumminess of this. I had to have Dustin help, and he was not too excited. So it really isn't the best, and it is kind of hard to see, but this was the best that I could get. Just try to make your stitches as even as possible. I kind of rock the fabric back and forth to help punch through the holes a little easier. Now for the really fun part. The fancy edging! There are many different edges that you can do. Some of my favorites are the shell stitch, v-stitch, and the puff stitch over a half double crochet. I find most of my edgings in books or online. But since the puff stitch over a half double is my favorite and the one I use the most, I'll try my best to show you how to do it. Once you have finished the first round of single crochet, join the last stitch to the very first stitch you made with a slip stitch. Chain two to get to the second row. These first chain two's will act like the first half double crochet. Then do a puff stitch in the stitch before the two chain just made (if you are a righty then this is the stitch to the right of the first chain twos. If you are a lefty, then.....I'll have to ask my mom on this one but I think it will be the stitch to the left. Mom is that right?) 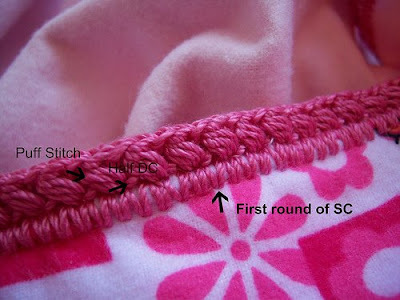 A puff stitch is done like this. Next, skip two stitches, and do a half double crochet in the third stitch. Note I skip two stitches from the half dc that I made. Does that make sense? A half double crochet is made by doing this. Yarn over, go into the stitch, yarn over, pull through all three loops. Then do a puff stitch to the right of the hdc just made. Technically it is doing a puff stitch in the second skipped stitch. Here is another crummy video to try and show you what I mean. I'm really sorry I am not better at describing this. Keep repeating this pattern until you have gone all the way around the blanket. End by joining the stitches with a slip stitch. Make a knot to end and then weave in the ends. I usually iron my blankets again once I am all done to help make the edges lay flat (I crochet really tight) and then wrap them up and send them off to the new owners. I really hope this tutorial helps. I am definitely not the best at describing stuff. I hope that it wasn't too confusing. If you do make any receiving blanket, please send pictures. I'd love to see them. If you have any questions, just let me know. I'll try my best to answer them. I've had a few questions on this tutorial. So I'll just clarify a few things. After I put the flannel together and square it up, I sew around the edges with the wing tip needle. You can serge around the edges if you prefer, it works either way. I just prefer to sew around the edges because I don't have a serger and then I don't have to borrow my moms just to do it. I have done it both ways, and they both look great. When I do the sewing with the wing tip needle to punch the holes, I do have the machine threaded when I sew. I've never tried it without the thread, but I'm sure that it would work if you serged the edges first and then sewed around it with a wing tip needle and no thread. Oooh wow!!! Thanks for picking my name Dustin!! I know 3 people expecting babies in the nest few months, so there will definitely be a good use for the blanket. Thanks so much! This is a great tutorial! I remember thinking you must have had a edgerydoo tool to get all those stitches so even. This sounds like a quicker method- just need a sewing machine. Thanks so much for sharing how you make your blankets! Ok, that was in my opinion the Best tutorial ever, specially since Engish is not my main language. I understood everything. Read your tutorial and it was wonderful but need to verify a couple of items before I start my blanket. Once you have everything trimmed are you serging or sewing the edges? Also when you use your wing needle, is it threaded or are you just leaving it unthreaded to make the holes? Any assistance would be greatly appreciated. Thanks. Thanks for the tutorial. What if you don't have a sewing machine? Can you just poke holes? Found your blog when I was looking for crochet patterns. We need to connect! I'm in Utah, my son-in-law is a Dustin, I have a cat, my best friend used to live in Raleigh, and I crochet baby blankets like crazy. Check to see if Raleigh has a Project Linus program. They would love your blankets. Roxanne- I hope these help and that it works out great for you. If you have any questions or need any more help or advice you can email me at raverlygirlATyahooDOTcom. Good luck and I can't wait to hear how it turns out.